Some say your choice of strings determine 70%, and the racquet only 30% of your equipment‘s performance. Others say it’s more 50/50, but whatever the exact %, it’s a very important choice ito your equipment. Although the right equipment is not going to help you play like Roger Federer, Djokovic or Nadal, it certainly can help you improve your game a lot, especially if it’s matched to your style and level of play. With that in mind, let’s quickly go through what’s important in selecting the right string and tension for your particular racquet and playing style. The big advancement in tennis technology the last few years have been in strings and their materials. The new materials and technology are mainly responsible for the huge amount of spin players are now able to generate which allow for more control and higher trajectory shots with bigger margin of safety over the net. Poly strings are used by nearly all ATP players on Tour in either the mains, crosses or both of their racquet strings. It is also the properties of these strings, by allowing them to dip the ball fast over the net with huge topspin, if needed, that have allowed the baseline players of today to effectively neutralise many net rushers. If topspin is important for you (and for who is it not ? ), the following parameters should be considered. The tests seem to indicate that movement of the strings relative to each other determines the most spin being generated. The strings must move and then snap back quickly. So lets see how the above factors all influence this metric. In general, the harder (or stiffer) co-polyester material generates a lot more spin than the traditional softer natural gut material. The most expensive string by far is natural gut, although it is not as durable or spin friendly as a poly. Inbetween these two is the multi-filament nylon strings which play “softer” on the arms and elbows vs a poly, although not as soft and elastic as the natural gut. The negatives of the multi-filament nylon strings is that they dont last long and are pretty expensive too, which doesn’t make it a very popular choice for budget conscious players. Many players compromise by making a hybrid, which is a combination of either a natural gut ormulti-filament string for their mains and then maybe a poly for their crosses, or vica versa or some other combination. This is still expensive, so for the rest of this article only a single material full bed string setup will be discussed. In this regard co-polyester, or just poly strings, have become very popular with the pro players on the ATP Tour for reasons of better spin, relative good tension retension, durability and excellent price performance , ie great value . You also get so called synthetic gut or S-Gut strings which are cheap and extremely durable but very hard, stiff, and unresponsive, and can damage younger or older players arms and elbow tendons if they try to hit too hard, or with bad technique. It is probably only to be recommended for beginners or little kids only starting out that don’t yet hit the ball hard enough to hurt their arms and where parents need the strings to last forever. The “hardness” of the poly strings allow the COF (friction) to be lower between strings, and this allows for more movement. Together with a good manufacturing process, as well as the coating material used in high quality strings, it will improve the friction, or worsen it with bad quality strings . Next up to consider is the diameter size, or gauge of the string. A thicker string, say a 16G or 1.27 mm, will have a bigger diameter and therefore more string material in contact with each other, which leads to more friction and less movement if all else stay the same. So therefore the thinner strings, say a 18G or 1.18 mm, will have more movement and more spin potential. The drawbacks of too thin strings are less durabilty (they are going to break more often). The string tension are also going to be lost faster. Basically you are going to replace more strings more often with very thin strings, which is a financial constraint for some and a good reason to invest in your own stringing machine if you are serious about your tennis (More on this later). It is also worth mentioning here that the string pattern of your racquet works on the same principle of more material in contact with each other in a closed ( eg 18 x 20), less spin, vs an open (16 x 15), more spin, string pattern. The newest so called open pattern “Spin” racquets from Wilson is a good example of new technology allowing for much more spin generation on the ball. One of the drawbacks of the new Open Pattern, or Spin friendly racquets, is that they tend to break strings fairly quickly comparatively as there are less strings to share the same load. The profile or texture of the string is also something to consider nowadays, as new technology and materials and manufacturing processes have allowed many different profiles to appear on the market apart from the traditional “round” or circular pattern. Newer profiles like square, hexagonal, octagonal, etc have sharp edges which are claimed to “bite” more into the ball to create more spin. There is no reliable data which profile is best although the shaped profiles seem to create more spin than round profiles. Last, but definitely not least, you have to consider what tension to string your racquet with. String tension is very important and can make a big difference in the performance of the racquet. Traditionally, before the modern lightweight and oversized racquets became available, the very stiff and small head size racquets benefitted from the elasticity of natural gut strings which helped to generate more power. With the modern racquets however power is no longer a problem for most players, with control and spin becoming more of a priority. It is here where the poly strings come into play and have their big advantage. Most poly strings are stiffer, with less elasticity (feel more dead) , than the traditional natural gut strings. This allow players to hit the ball harder, with full swings and more racquethead speed , therefore creating more spin and control to not let the balls fly long or wide. This has bring a new dimension to the modern game of tennis, especially from the baseline. 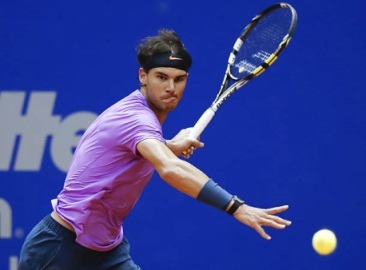 A good example of this type of play is of course Rafael Nadal, who generates huge amounts of topspin, with the ball coming from higher, falling deep and bouncing high on his opponents back hand if right handed, especially single hand backhand (just ask Roger Federer !). All players know how difficult it is to play such a shot on your backhand consistently with enough power and depth to not put it back short ! So back to the string tension needed. Poly strings allow tennis players serious about their game to use a wide variety of string tensions depending on how much power or spin they need. If you are a big, strong hitting player with enough power, you are probably going to string your poly’s at around 60 pounds which are going to give you excellent spin and control, ala Andy Murray. But he is one of only a few pro players that string their poly’s so tight these days and many players benefit a lot from stringing a lot softer around 40 – 50 pounds. Without losing too much control (or none at all), they benefit with even more spin and power. A win-win . 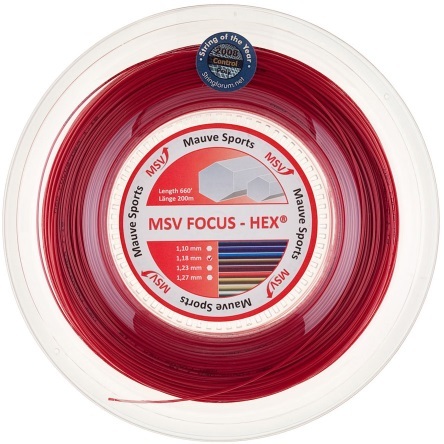 So to summarise, Poly (or co-polyester) tennis strings offer a lot of advantages over traditional strings like gut and multi-filament nylon, with performance vs price, ie value, the biggest by far. A good way to judge the popularity of a string is to see which strings are used and recommended the most by players themselves. Here it is usefull to visit a website like www.Stringforum.net where players review and rate the different strings they use and play with. Look for strings where there are many reviews, at least more than 50 or so, to get a fair opinion. A good filter is to look for the strings that offer the best Price-to-Performance or Value for money based on many players’ opinions. The most expensive and biggest brand names are not the always the “best” strings and smart players know how to search for value. Good video below on Poly strings.